Levitt-Fuirst is honored to have received The Business Council of Westchester’s 2017 Hall of Fame Award in the “Family Owned Business” category. Click the image above to watch the short video the Business Council created to tell the story of Levitt-Fuirst. On April 25th, we received the award on behalf of the Levitt and Fuirst families, as well as our family of 62 employees. The 15th Annual BCW Hall of Fame Celebration was held at Glen Island, in New Rochelle, NY. Many of you knew, and did business with David Levitt and/or Alan Fuirst. As we approach our 50th Anniversary, we are proud that the business Dave and Alan founded together in 1969 is being honored by The Business Council of Westchester. Levitt-Fuirst now employs a staff of 62, which is double our size from just 10 years ago. We are humbled that this business has thrived and grown, because of successful and loyal clients and friends, like you. On behalf of Levitt-Fuirst, thank you for your business and your support. Award celebrations come and go, but business relationships that span years, decades, and even generations, are hard to come-by. Levitt-Fuirst was named 2017 Top Specialist Broker in Real Estate & Construction industries by Insurance Business America Magazine. The award is a great honor for our agency, validating our long and influential relationship with both of these key industries. Our commitment to the industries can be seen in our two managed workers compensation safety groups, Safety Group 458 for contractors, and Safety Group 530 for real estate property managers. These groups offer 20-30% discounts over comparable New York State Insurance Fund policies, and have been effective advocates for both industries in matters of insurance and legal liability. In addition, Levitt-Fuirst works closely with The Building & Real Estate Institute of Westchester to offer informative articles, presentations, and services to assist BRI members in managing their businesses insurance programs. The highly regulated New York State market requires business owners to find knowledgeable professionals to guide them in understanding the legal requirements, as well as to fight against those laws that harm our business partners (such as the “scaffold law”). We are proud to announce that Levitt-Fuirst is one of the winners of the first-ever joint Westchester and Fairfield County Business Journal awards for top family-owned businesses. We have worked throughout our company history to have a positive impact on the region, and look forward to continuing to be a leader in Westchester’s business community. The following essay was submitted to the Westchester Business Journal by Levitt-Fuirst, focusing on the long history of Levitt-Fuirst in the region. “One of Westchester’s largest independent insurance brokers, Levitt-Fuirst has involved three generations of Levitt and Fuirst family members. Currently the Principals are made up of co-presidents Jason Schiciano and Ken Fuirst, with Valerie Levitt as CFO, and Ondrea Levitt Schiciano, Marketing VP. Dave Levitt and Alan Fuirst were best friends in law school and when they graduated they each joined their father’s insurance business. In 1969 they combined businesses and created Levitt-Fuirst. Over the years, the 12 person firm grew into a very successful, highly respected insurance agency. 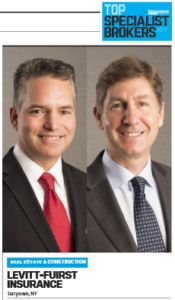 The third generation, with the addition of Darryl Friedricks as a key executive since 1994, has grown the company over the last 22 years, and now with 50 employees is one of Westchester’s most successful independent insurance brokers. The growth occurred by further penetration of their niche construction and real estate business, and at the same time, by developing a highly successful general business group that services some of the largest manufacturers and distributors in the area. Levitt-Fuirst also expanded into the high-end homeowners markets by offering unique services that no other agency in the tri-state offers. They are recognized as a Chubb Cornerstone agent and represent other leading companies like ACE, AIG and PURE. We are proud to announce that the national trade periodical Business Insurance has named Levitt-Fuirst as a winner of their Best Place to Work in Insurance competition! This summer our 50 employees completed an anonymous survey on their opinions about working at Levitt-Fuirst. This included questions about: their compensation and benefits, how they are treated and respected, opportunities and recognition for individual achievement, what they thought of their co-workers and managers, and some general open ended questions. Levitt-Fuirst Principals also had to complete an in-depth survey that took about 3 hours to complete. This involved information on: salary distribution, benefits offered, availability of flexible work schedules, number of minority employees, female and minority managers, how do we recognize individual and group achievement, and employee longevity. We also had to submit pictures of activities we do as a company, such as our Habitat for Humanity project, our offsite team building exercises, and our summer fun day at the beach (including employees’ family members)! We know that our employees are our strongest asset. We do our best to help them to thrive, both as individuals and as members of a team. We strive to offer our staff the independence needed to achieve personal success. To retain the best in the industry, we provide innovative incentives, such as subsidized gym memberships and healthy lunches, monthly recognition awards, and fun celebrations (when deserved!). We are very proud of this Best Place to Work in Insurance award, especially since it reflects that our employees enjoy being part of the Levitt-Fuirst family.